Oyster Salad Boil 2 doz. small oysters for 5 min. in water enough to cover them; add a little salt & a tbsp of vinegar; drain & cool. 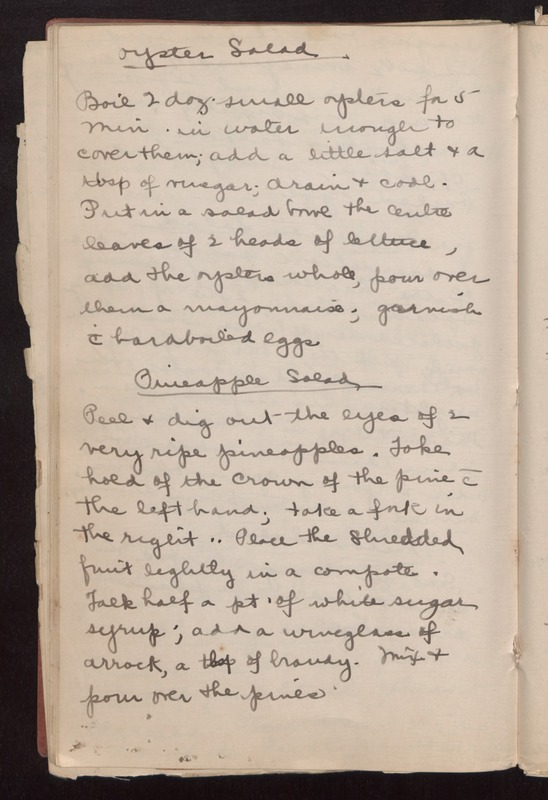 Put in a salad bowl the centre leaves of 2 heads of lettuce, add the oysters whole, pour over them a mayonnaise; garnish '/c hardboiled eggs Pineapple Salad Peel & dig out the eyes of 2 very ripe pineapples. Take hold of the crown of the pine /c the left hand; take a fork in the right.. Place the shredded fruit lightly in a compote. Take half a pt. of white sugar syrup; add a wineglass of arrock, a tbsp of brandy. Mix & pour over the pines.